The Opteron When new hardware comes out, the process of setting everything up often changes in many ways. This mini-review of the Opteron is meant to give you and idea of how to set up new systems based on the Opteron/Athlon64. There are plenty of reviews of the Opteron out there, so I'm not going to do a whole bunch of benchmarks here. The Opteron is meant for server boxes, so it's pretty darned expensive. The Athlon 64, which just debuted this week, is also very expensive when compared with the Athlon XP. 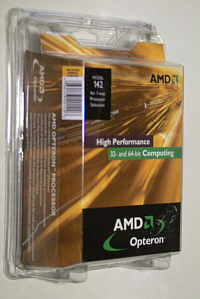 I chose the cheapest Opteron available, the single-CPU model 142 which runs at 1.6GHz. They cost a little over $320US. I will be taking a look at the Athlon 64 shortly. Asus MyLogo2 personalizes and adds style to your system with customizable boot logos. The CrashFree BIOS 2 feature now includes the BIOS auto-recovery function in a support CD. With ASUS EZ Flash, you can update BIOS before entering operating system. No more DOS-based flash utility and bootable diskette required. The SK8N's S/PDIF out function turns your computer into a high-end entertainment system with digital connectivity to powerful speaker systems. The SK8N uses an onboard Audio CODEC that lets you enjoy high-quality 6-channel audio without having to buy advanced sound cards. Incorporation the advanced two SATA and one parallel connectors with RAID 0(striping), RAID1(mirroring), and RAID0+1 functions. 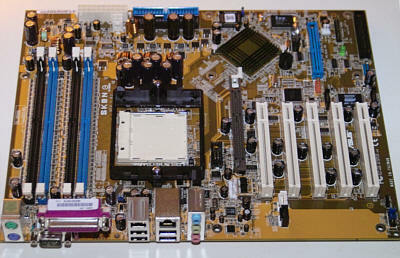 The test system was composed of an Opteron model 142 (1.6GHz) CPU running on an Asus SK8N (NForce3 chipset) motherboard. It took me some time to find the correct memory to run with the Opteron. I wanted to use 333MHz PC3200 DDR, but the Opteron requires "registered" ECC DDR RAM, which is more expensive and harder to find than standard DDR. Many vendors has PC2100 registered DDR modules available, but very few had PC3200 registered ECC DIMMs. ECC stands for "error correction circuitry", which checks to make sure that memory transfers to an from the RAM are error-free. "Registered" ECC RAM, on the other hand, has additional data registers that hold the data for one extra clock cycle before making the transfer, and this improves accuracy further. Server motherboards often required registered DIMM modules. I finally found some very good 512MB Samsung PC3200 registered ECC memory, and bought 2 sticks in order to use the dual-channel memory feature. The lack of availability of high-speed registered DDR memory may hinder early adoption of the Opteron. Note that the Athlon 64, which is a very close relative to the Opteron server chip, comes in two flavors. The standard Athlon 64 fits in a 754-pin socket, and has only a single channel to the memory. This model is meant for lower-cost systems. 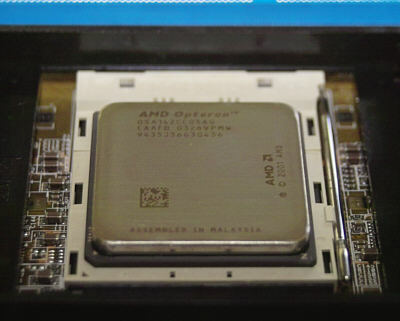 Most gamers will want the more expensive "Athlon FX51" CPU, if they can afford it. It currently uses the Opteron 940-pin socket with dual-channel memory support, so they go onto Opteron motherboards, which are more expensive. The SK8N is approximately $230US, which is about $100 more than an NForce2 motherboard. Early next year, AMD will introduce a new socket design for the Athlon FX51. The new design will have 939 pins, one pin less than the current design. The reason is that the 939-pin design can be implemented with a 4-layered motherboard, whereas the 940 pin socket requires at least a 6-layered motherboard design, which is more expensive. So next year, as new Athlon FX models arrive (FX53 and FX55), they may all be in the new 939-pin format, meaning they won't fit on the old, 940-pin motherboards. This makes the current motherboards pre-obsolete at launch, and may also hinder early Opteron adoption. The 939-pin motherboards will work with standard DDR DRAM, eliminating the need for registered ECC memory. The enclosure for the setup was the Antec 660AMG case with the 330W 'True Power' power supply. The video card was the Radeon 9800 Pro, and the hard drive was Maxtor's new 120GB Serial ATA drive. The Serial ATA drive required a little extra work to get it set up. The main purpose of this article is to help folks through the setup process for an Opteron or Athlon64 system. There are some significant differences over older architectures, which I'll detail below. The CPU drops in the socket just the same as older CPUs, and the heat sink attaches in a similar fashion. 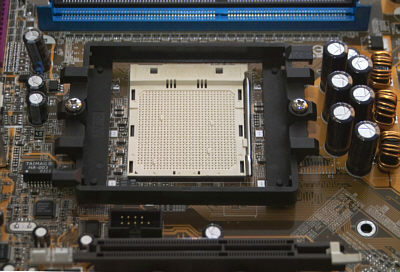 As with Pentium4 motherboards, there is a second power connector from the power supply to the motherboard for the higher power requirements of the CPU and chipset. The system won't boot if you forget the second power connector. The registered DDR modules plug into the memory sockets the same as regular DDR memory. Things get a little different when you get to the Serial ATA (SATA) controllers and drive. For the physical setup of the SATA drive, you need to use very different types of data and power cables that come with the motherboard. The data cables are much narrower than older IDE data cables, and use a different connector on both ends. Also, the drive power cables that come with the motherboard act as adapters between the standard case power connectors, and the new SATA power connectors on the back of the drives. After the physical setup of the drive, it's time to install an OS. I will be testing the system with Linux later, but for this review I used Windows 2000 with service pack 4. At first bootup you'll want to set some BIOS features before getting to the OS. Under the Advanced menu there are 4 options; CPU Config, Chipset, Onboard Devices and PCI slots. You'll want to go into the CPU menu if you want to overclock the Opteron/Athlon64. Only bus frequency and core voltage can be changed here on the SK8N. I was able to boot and run the system at 220MHz (default = 200MHz), which brought the system speed to 1,8GHz. The odd thing about the SK8N was that it would not keep this setting after the system was shut down and unplugged. It kept all other settings, but not the increased bus setting, so I don't think it wasn't a battery problem. I assume a BIOS update will fix this problem. Under the chipset menu you get 4 more options; Northbridge, Southbridge, AGP and Hypertransport. Under Northbridge, you get memory settings. Since I was using PC3200 registered DIMMs, I made sure the memory was running at 166MHz (=333MHz DDR). Under the AGP menu you'll want to set the aperture to 128MB, and make sure FastWrites and Sideband are enabled (auto). Once the BIOS settings are the way you want them, it's time for the OS. But before you can use your new SATA drive, you need to initialize it. For this, I used Maxtor's MaxBlast3 software which can be downloaded from their web site. For other SATA drives, go to the manufacturer's web site. After following the instructions for MaxBlast3 (which replaces FDISK), you are ready to use the FastTrack BIOS menu (Ctrl-F during bootup) to define a default RAID array. You should do this even if you have only one disk drive. If you know Windows 2000, then you'll know that non-standard IDE drives require special Win2K drivers. You boot from the Win2K CD, and then when the blue screen comes up, you have a few seconds to press the F6 key to install 3red party disk drivers. You need to do this with the SK8N's SATA controllers. The problem is that the FastTrack drivers that came on the Asus motherboard CD did not work. This caused a significant delay in getting the system set up, because I didn't know what was causing the drive recognition problem. But after some testing I decided it must be the driver, so I went to the Asus web site to get the latest driver. You need to use the "makedisk.exe" utility to make a floppy driver disk. That finally did the trick. I booted from the CD, hit F6, installed the newer SATA driver, and Windows 2000 install ran flawlessly. Obviously, the Opteron running at 1.6GHz is not going to be competitive with a Pentium4 at 3.2GHz, nor an Athlon XP running at 2.2GHz. So rather than testing the CPU against faster brethren, I decided to test other features, including memory bandwidth and SATA speed. One of the new features that comes with the Opteron is a dual-channel, on-die memory controller. This is a major change in processor design intended to reduce memory bottlenecks. And the good news is, it worked. As you can see from the graph below, the Opteron's memory controller beats PC4200 Rambus, and PC3200 DDR on Intel's dual-channel i865 chipset. Very impressive. When the Athlon FX51 gets paired with dual-channel PC4000 (400MHz) DDR memory on upcoming 939-pin motherboards next Spring, the memory performance will improve further. How about SATA drive performance? The SATA drive was about 15% faster than a standard 7200rpm 8MB cache ATA/100 IDE drive. But the now aging U160 SCSI still beats the new SATA standard. Conclusions The Opteron is a whole new CPU design that has tons of improved features and capabilities compared with the Athlon XP. But it's not really ready for gamers just yet. It really is a server design, and there are several very good reasons for gamers to wait before getting a 64-bit AMD processor. Right now the CPUs are expensive, but that will change as yields at the factory improve. When the 939-pin Athlon FX51 comes out paired with 400MHz DDR memory, it will provide a very powerful combination that should satisfy gamers needs for some time to come. And further, unless you will be using the system with Linux, you will not get the benefits of the 64-bit extensions built-into the Opteron/Athlon FX51 until Windows with 64-bit extensions comes out. Finally, the 940-pin design requires "registered" ECC DDR memory, whereas next year the 939-pin design will work with standard DDR memory. So if you already have a pile of 400MHz DDR that you don't want to go to waste, you'll want to consider waiting for the 939-pin chips and motherboards. I highly recommend the Athlon FX51 for gamers, over and above the Intel Pentium 4. But they are not ready for prime time just yet. So hang in there... you'll be glad you did. The Asus SK8N is a very nice first NForce3 motherboard. The lifespan may be somewhat limited due to the temporary nature of the 940-pin socket design. Rating, : 4.0 out of 5 smiley faces (80%). :) :) :) :) Recommendation: Wait!